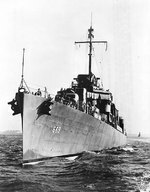 ww2dbaseWith Lieutenant Commander F. T. Sloat in command, destroyer Cotten departed Norfolk, Virginia, United States on 9 Oct 1943 for Pearl Harbor. Between Nov 1943 and the end of the war, she participated in every major campaign the Americans launched against Japanese positions in the Pacific, including the Gilberts campaign, Marshalls campaign, the attack on Truk, Marianas campaign (including Battle of the Philippine Sea), Philippines campaign (including Battle of the Surigao Strait), and Battle of Iwo Jima. After the war, she remained in Japan as part of the naval occupation force until Dec 1945. She was decommissioned at Charleston, South Carolina, in Jul 1946.
ww2dbaseAs the pressures in Korea built up, Cotten was recommissioned on 3 Jul 1951 and served a tour of duty in western Pacific. After several tours of duty in the Mediterranean Sea and in the Middle East, she was decommissioned again on 2 may 1960. She was sold 31 July 1975 and broken up for scrap. 24 Jul 1943 Cotten was commissioned into service. 15 Jul 1946 Cotten was decommissioned from service.